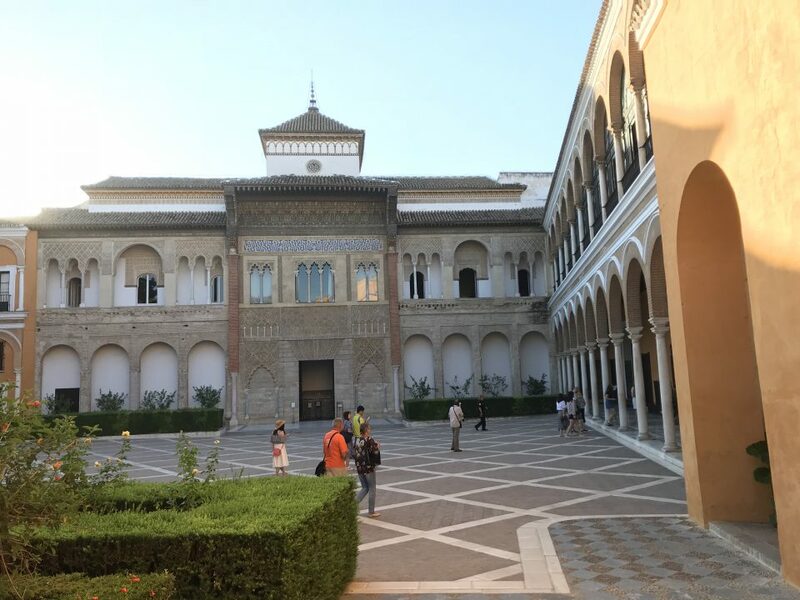 Today we visited some of the major tourist attractions of Seville such as the Alcázar and Cathedral. 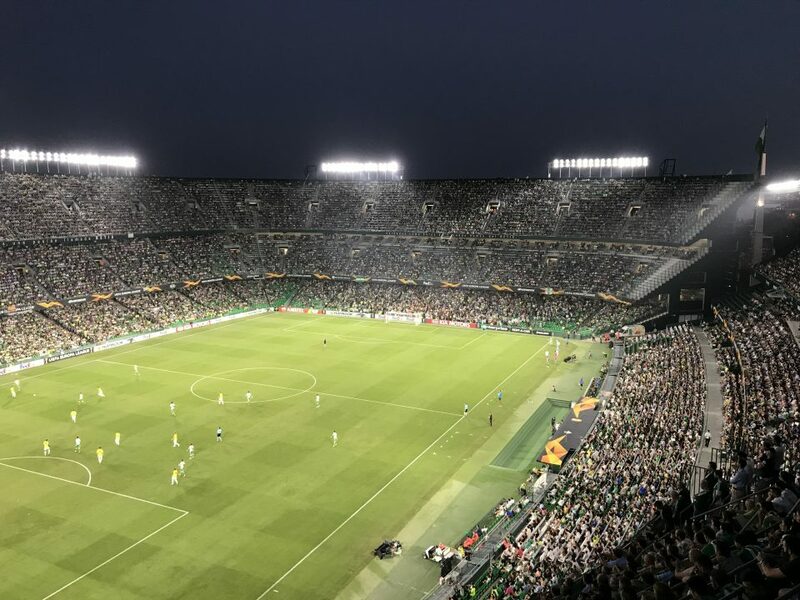 In the evening we cheered on Real Betis in the Europa League. We had a good night sleep after a great day in Cordoba yesterday and left the hotel to hunt for our breakfast. By hunt I mean find a suitable place to eat. We found one suitable establishment and then walked through El Centro to our first destination of the day. We arrived at the Alcazar and joined the pre-booked queue. Luckily we booked our tickets in advance as the queue for the ticket office spread as far north as Madrid. The Alcazar of Seville was built in the 14th century and is a UNESCO World Heritage site. The doors opened at 9:30 and we entered the Alcazar through the Lion Gate. Both of us set the security alarm as we walked through the gate with our mobiles. Oops! We then entered the pretty Patio del Leon and Patio de la Monteria. 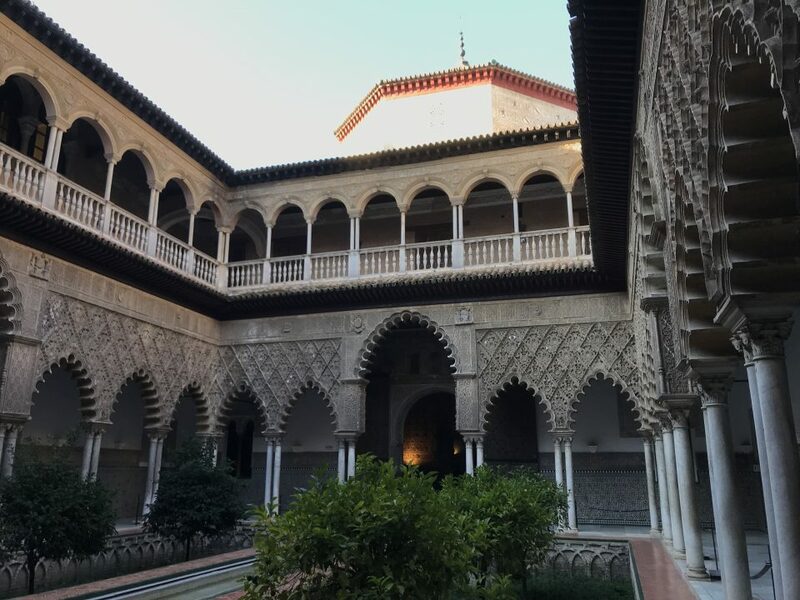 This led us to the impressive Patio de las Doncellas which boasts decorative archways, tiles and a central water feature. While trying to get some photos, one gentlemen on the other side of the patio was motioning for me to move as he wanted an empty shot of the patio. Considering the Alcazar is one of Seville’s major attractions and there were many others behind me, he was in for a tough job. All the rooms connected to this patio are part of the Palacio de Don Pedro. They were simply stunning with their art and architecture. 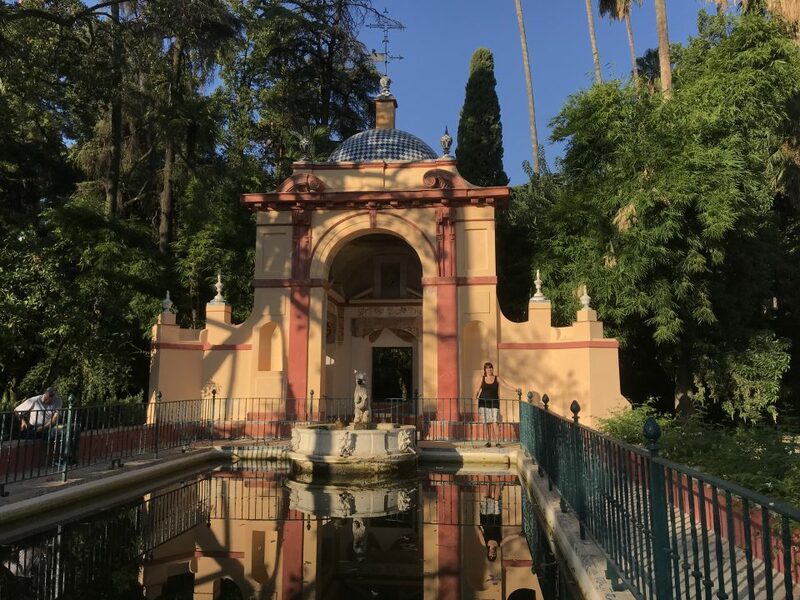 We then wandered down to the gardens of Seville’s Alcazar. These were very pretty with lots of tiles, flowers, trees, fountains and annoying flies. Wanting a rest, we sat in front of the Lion Pavilion where two fighting ducks nearly decapitated me when flying away. That wasn’t our only brush with naughty avians. As we sat to have a cold drink with a cheese pastry a squadron of peacocks surrounded us looking for food. Get your own! Once we left the cathedral we walked over the road to Seville Cathedral. Stupidly I didn’t order tickets in advance for this, so we queued for nearly half an hour. I could feel what little hair I had burn away from my head. When we eventually gained entry we were astounded about how many people were in there. It was like baked beans in a can. Luckily there was plenty of room, as when the cathedral was built in 1401, the architects apparently said “we are going to build a cathedral so large our future generations will think we were mad”. 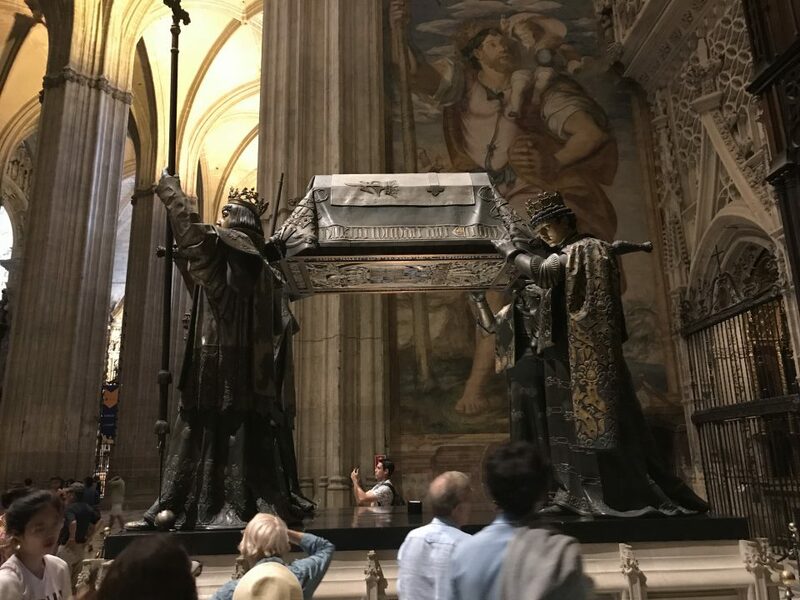 The main thing we wanted to see in Seville Cathedral was the tomb of renowned explorer Christopher Columbus. Very grand! 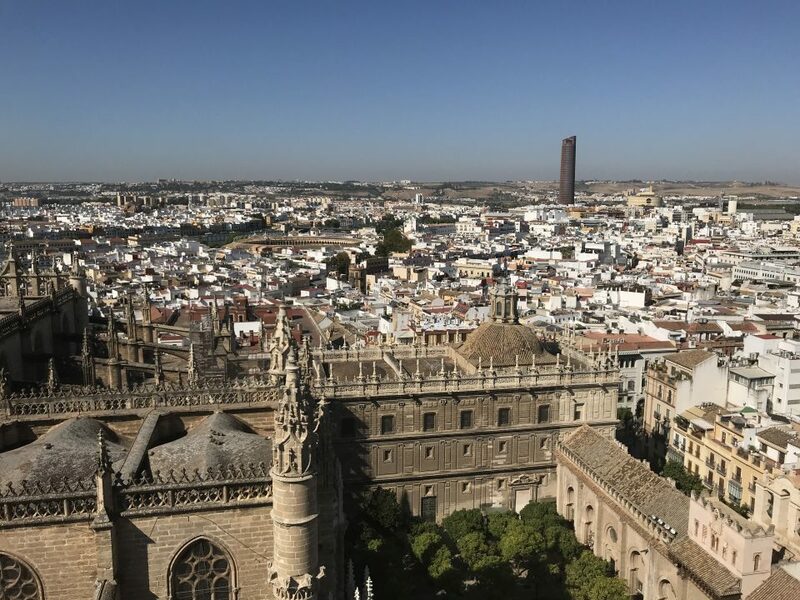 It was then time to scale the bell tower of Seville Cathedral – the Giralda. Instead of stairs, there was steep stone ramp all the way to the top of this 104 metre high tower. The view at the top of Seville was fantastic and we could see for miles around us. Although Hayley jumped out of her skin when the bell went off! We definitely deserved a nice lunch after climbing the Giralda Tower, so we made our way to Bar Pelayo. 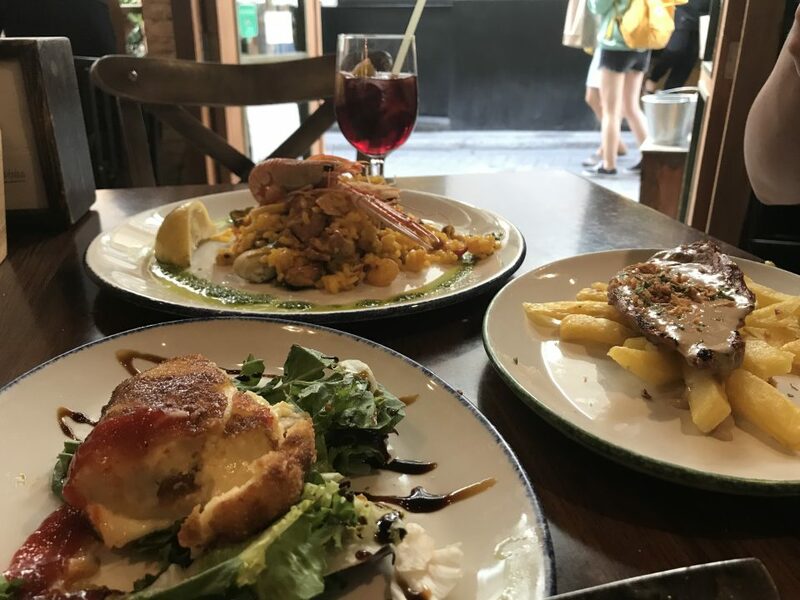 Tapas was our choice and we ordered seafood paella, baked Camembert, Spanish omelette and Iberian pork with mushroom sauce. Delicious stuff. 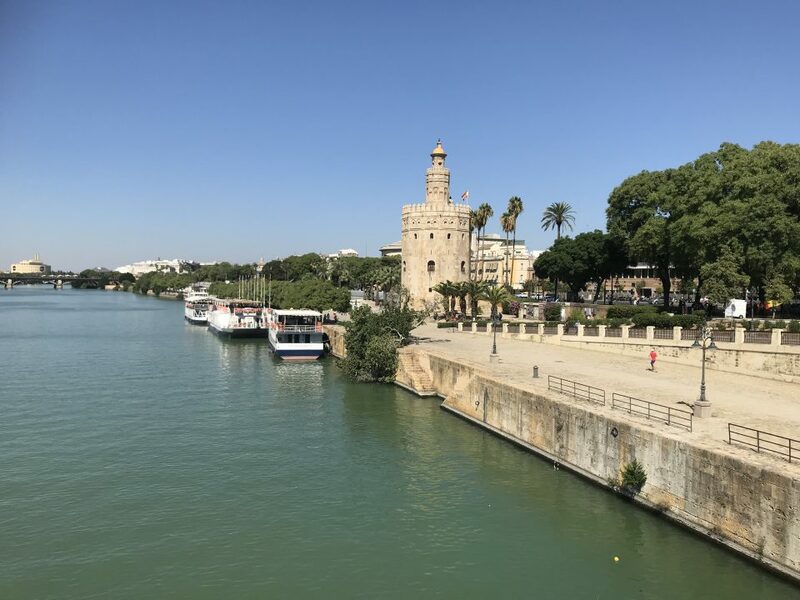 We then walked down to the river to see Torre del Oro or the Tower of Gold. There wasn’t much gold on display to be honest but it was interesting to look at nonetheless. It is said that the tower was once used to store the treasures brought back from South America. Perhaps that was the reason for the name? While down by the river, we noticed boat trips were operating. We always love a trip on a boat so we decided to give it a go. The boat sailed past a number of attractions including Plaza de Toros, Torre Banesto and Puente de la Barqueta. 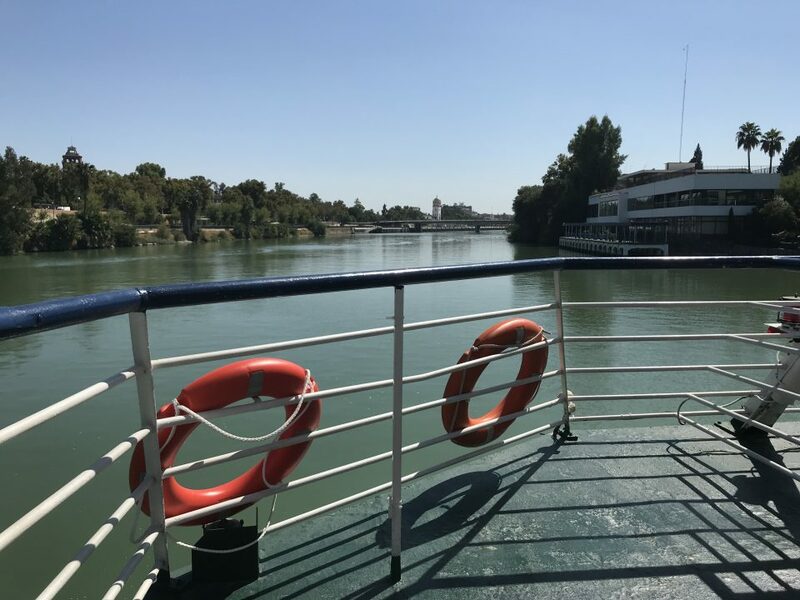 It was nice to sit back and relax with views of Seville, especially with a cold beer in hand. Finally it was time to head off to the football. Real Betis were hosting F91 Dudelange in the UEFA Europa League. Once we arrived in the proximity of the Benito Villamarin Stadium, we went straight to a local bar where Real Betis fans were enjoying a beer before the game. We arrived at the ground well before kick-off and took our seats for the game. The Real Betis fans belted our their anthem in style and then the game began. The first half was uneventful with the score tied at 0-0. The second half was dominated by Real Betis who won 3-0. A few observations of the game. Firstly the crowd were lively all game and the ultras sang non-stop for 90 minutes. Secondly, the Real Betis fans love nuts. The floor was absolutely covered with the shells everywhere you looked. We are off on a day-trip to Cadiz tomorrow and we hope for another good day. If you are on social media you can also follow us on Twitter or like us on Facebook. Have a look at our photos on Instagramand Flickr. You can also watch our videos on YouTube. So much history as well as humour goes into your blogs. You certainly pack so much into your holidays.